Have you ever been deeply hurt by someone you believed to be a friend? Several faces come to mind when I consider this question. They have the same theme in common: I was dropped from the friendship like a hot potato, suddenly, without any warning. These are friends with whom I shared my heart. Friends with whom I traveled, laughed, and enjoyed meals. Friends I invited to important events, and they invited me to theirs. Friends I thought would weather life’s changes with me and stick around. Not every friend is meant to last forever. Sometimes you have school- or work-related friendships that last only while you are at that location. If you move or change churches, it’s easy to lose touch over time. But that’s not what I’m talking about today. I’m talking about friends that knew you very well but rejected you anyway. Let’s admit the truth: Mean girls don’t stay inside middle schools or high schools. They’re still alive and well in their 30s, 40s, 50s and beyond, seemingly unaffected by their bad behavior. 1. Take your hurts to God. In 1 Peter 5:7 we read, “Cast all your cares on him, because he cares for you.” God cares about your hurt feelings. If you are hurting, cry it out before God. Let him comfort you with his constant, loving presence. Allow him to sift through your feelings and give you insight you can’t find yourself. 2. Consider whether you’ve ever hurt someone else. I was once one of those mean girls. In junior high, I rejected my best friend for the “cool” crowd. It hurt her badly and I felt terrible about it for a long time. But I’m happy to say we reunited in high school and we’re still friends after 30 years. She has stuck with me literally closer than my sisters at times. Since I’ve been a mean girl, I tend to look at the friends who have hurt me with greater compassion. I was hurting or striving for unworthy things when I was a mean girl, and I know what it’s like to make mistakes. You can use your past experiences to show empathy toward your offender. No one likes to hear this advice, but it’s the only way to heal from a bad friendship. Every time you think of her, release her to the Lord. Pray blessings on her rather than cursing her. This will be hard at first, but it will get easier with practice. Trust me, I’m speaking from experience. 4. Turn to godly women for new friendships. My closest friends who stick super close to me in both bad and good times are all godly, committed Christian women. They know my praiseworthy side and my sinful side. They were there for me when I endured a marriage separation and other times when I needed serious prayer. I consider them my real friends. I’m not saying that Christian women can’t hurt you. Priscilla Shirer shares a story in the book Fervent of a close church friend who was jealous of Priscilla’s success when everyone else was supportive. Priscilla confronted the woman under the Lord’s guidance and learned that the woman was carrying her own pain at the time, which unfairly blocked their friendship. They reunited as friends after the confrontation, which may (or may not) be possible for you. You have a better chance of finding a friendship that lasts with a godly woman than a woman whose heart pursues the world. It might take several tries, but a godly friend is a treasure worth pursuing. Friendships can be messy, just like all other relationships. To go deep with a friend, you must be vulnerable, and you truly risk being hurt. I can honestly say that none of my closer-than-a-sister friendships happened without deep vulnerability on both sides. I know the pain of friendships that destroy, but I also know the abiding joy of friendships that last. Be the kind of friend who sticks closer than a sister. You can’t control how people react to you. You can’t even control whether they will someday drop you like a hot potato. But you can control the kind of woman you are. You can be someone’s good friend, and God will help you have the courage to risk vulnerability in a friendship. In our lonely world, many women are desperately searching for lasting friendships. Who do you know that needs your friendship today? 1. What is your first memory of being hurt by a friend? 2. What can you do to be a good friend to someone this week? Thank you for sharing this today. 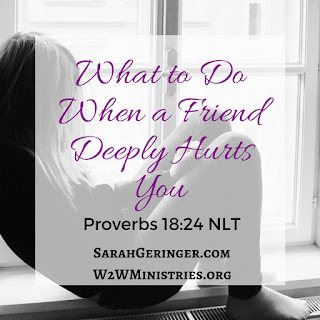 We all have hurts over friends who have dropped us like a hot potato and I appreciate these helpful and Godly tips. God bless! Excellent wisdom here, Sarah! I appreciate the practical point about seeking out other Christian friends. We cannot go it alone, but it's good to remember that ONE friend who hurt us wasn't our only friend. Connie, blessings to you as you seek God's healing from those hurts. Thanks for your comment! Betsy, I count YOU as one of my Christian online friends, and I know I could trust you well with my heart! Blessings to you! This is a great topic, especially in our throw away world. I just want to add that really dear friends, sisters in Christ, are hurt by each other too. This just happened between a dear friend of mine and myself. We disagreed about something that happened years ago and that I shared as a lesson in one of stories. I learned a valuable lesson again from my friend. However, the important part is that her friendship is far more valuable than whether we agree or disagree. I don't want all of my friends to agree with me about every topic. I like diversity in my friendships. I enjoy discussing and working through places of differing opinions. So, I just want to add that realistically even the best of friends will disagree and hurt each other from time to time. The important aspect is that the relationship is more important than being right. Great post, Sarah! Pinning this. Thanks for sharing, Sarah! These are some great pieces of advice! Thanks for stopping by, Lesley. I enjoyed your post and shared it today too. Sometimes friends and sometimes family, sometimes, I am amazed we serve the same God and are not even on the same page. I agree, Rebecca. This is certainly a problem inside AND outside the church. So glad we can find comfort in God's arms and through other Christians for this problem. Dear Sarah, thanks for sharing godly wisdom that I need to embrace and implement. I fear multiple breaks in trust and rejections have left me with a jaded shell. Forgiveness and vulnerability are risky choices I definitely need the Lord's help to make. Blessings! Thank you for sharing and your honesty about being a mean girl at one time. I bet we all have at some point but choose to either ignore it or didn't realize it. I am going to ponder that a bit. I find there is always more to the story than what we see. I try to be open as to why they pulled away. Life dealt me some difficult circumstances and I had to pull away pretty much from life. I could't always explain why, and I am sure in that pulling away feelings were hurt when it had nothing to do with them. However many of my friends stuck by me like glue and understood when I couldn't participate in the relationship as much as I used to be able to. They didn't always need an explanation. Friends have hurt me and I have hurt others as well. I am having a troubled time with relatives right now, but think the steps that you shared are very applicable to my situation. Now I have to go to my prayer room and ask forgiveness over my own unforgiveness. It is going to be process. I am sure the person thinks they have done no wrong in this situation. Thanks for your words of wisdom that you shared on the #LMMLinkup this past week. Still dealing with the heartache and disillusion. Thank you for these great reminders!